I have never been stung by a bee. All of my kids have, but not moi. Am I in the minority? The mere thought of being stung gives me the heebie-jeebies. While I was hunting through the post-Easter clearance shelves at Target last month, I came across these. Have you ever seen such an ADORABLY tasty treat?! Lindt hazelnut chocolatey goodness. Yum. Eeny, meeny, miny, mo... you lose little ladybug. I almost feel guilty for eating their friend. Look at how they are looking over and smiling... they have NO idea the extent of its injuries. Do you think I fooled them? I think I need to get out more. Or sleep more. Or drink more coffee. I'm starting to scare even myself. I am linking up with TidyMom today. Come join the fun! I can't believe you have never been stung! That's amazing. Nater got stung tonight, right by his eye. Fortunately, it didn't swell up very bad. 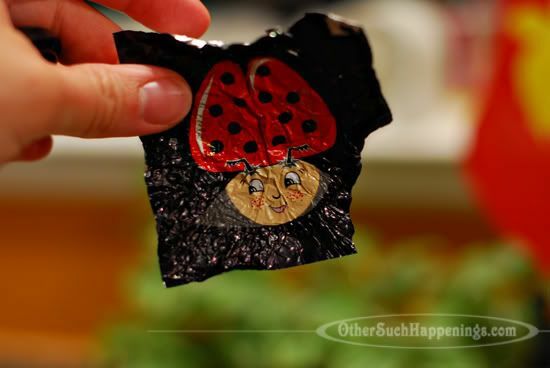 I would take chocolate bugs over the real ones any day. Those little guys are SO cute! Reagan and Ava Rose LOVE LOVE LOVE LadyBugs---I have to find those! I looked in the freezer for my chocolate bar (w/ coconut of course) and it was GONE!! when confronted, Micah said, "I was trying to help you..." uh.huh. I've never been stung by a be, but I did step on a yellow jacket when I was a kid. Yes, it hurt. i'm with Christine in the first comment, EAT THEM ALL, just to put them out of their misery of course. Your too funny and the little bugs are so cute..I'm with Christine just eat them.. Oh and I have been stung many of times by bees when I was a kids..Not fun..
Haha you are too cute. I have never been stung either, thank God. It sounds painful. Lindt makes such awesome chocolate. I didn't know they made stuff that cute though. 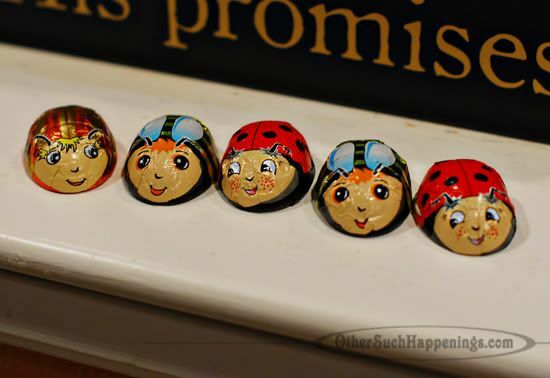 :) Those are very cute chocolate bugs. 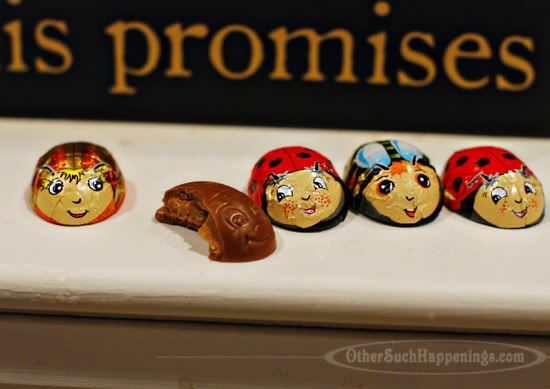 And I'm with everyone else, I would take the chocolate ones over a real bee any day! I've only been stung once and long enough ago as a child that I remember crying but I don't remember the pain. Funny, huh? Hope you enjoyed every bite! love the simpleness of your blog posts. you can tell you take joy in the small things and like to share that with others. I can't even count how many times I've been stung. But it's been awhile now, shh.. don't tell them. You are so silly. Thanks for the laugh today. 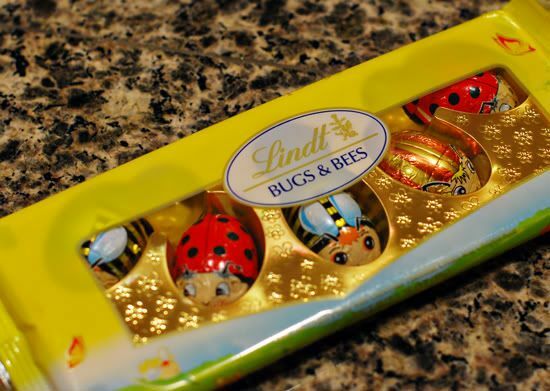 I would eat *those* chocolate bugs! That was truly a fun, creative post:) Thanks for sharing. And, I was happy to "meet" your sister the other day (in cyberspace). We are neighbors... small world! I'm thinking LESS coffee :) Totally not. Who can do that?? Almost too cute to eat - but I'm with you - I'd eat them anyway. 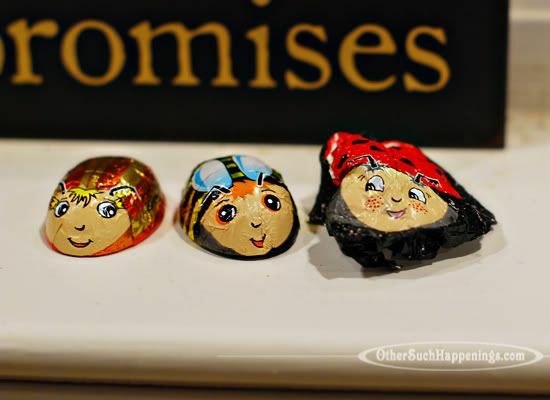 :)_ One can't be too sentimental about chocolate! Those are the cutest bees EVER! Hilarious! I giggled myself silly over this post, Marsha. Never been stung by a bee? You are so......well, blessed. I hate bees!